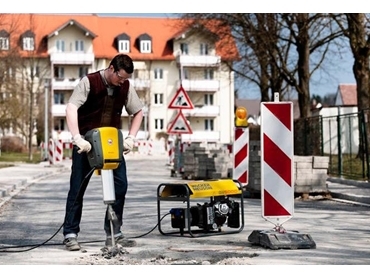 The Wacker Neuson electric demolition hammer EH 25 weights 25 kilograms and has a 70 joule single stroke energy. Lightweight and yet powerful, the EH 25 electric demolition hammer has a shock wave optimised hollow piston percussion system with a asynchronous motor that comes with a carbon brush free drive. With efficient full hood vibration damping it also offers first class vibration damping for lower hand-arm vibrations. As a powerful electric hammer, the EH25 can also be used as an attractive alternative to a 30kg pneumatic hammer in addiction to all the classic uses too. The EH 25 is easy to transport and can be used quickly and easily without needing a compressor.